Canova was the most important sculptor of Neoclassicism and a real master in representing ideals like beauty, perfection and proportions in his work. His name is indissolubly fond of his birthplace, Possagno, a small town at the feet of the Montegrappa. 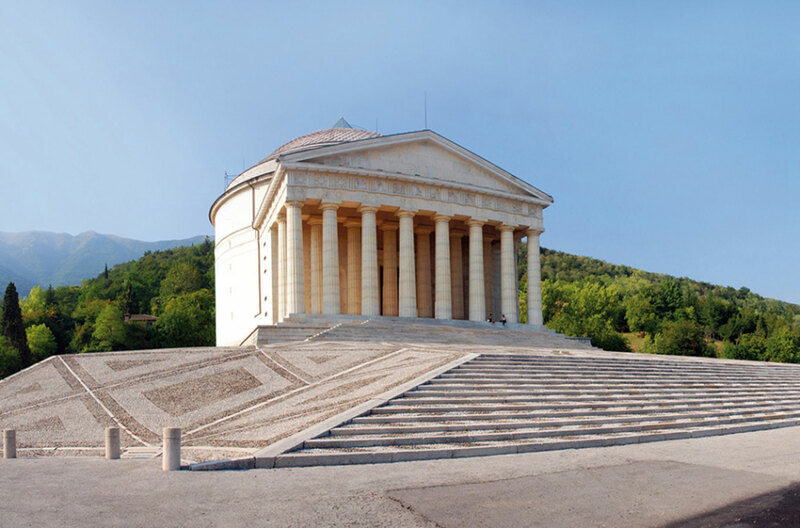 Here you can find the native house of Canova as well as some of his most important works like the Temple, the Venus Statue and the Three Graces. The Temple was given to the community as present by the artist and is now the parish church of Possagno. It represents the fusion of the two archetypes of Classical art or rather the Greek Parthenon in Athens and the Pantheon in Rome. Inside you can see a monumental tomb with the remains of Canova except for his right hand and his heart, which are preserved in Venice. Just a few steps from the Temple, there is the Canova museum, which hosts a rich collection of marble and gypsum works such as Cupid e Psyche, the Venus Statue and the Three Graces. Don’t miss the chance to wonder his masterpieces and learn more about the process through which he kept proportions unaltered in each step of the creation. In the 19th century a new space was created by the architect Carlo Scarpa, to exhibit other works of Canova, which were temporary stored in the basement to protect them during the Second World War.